The first lighthouse was 37 feet high, a lantern on the roof of a square wood dwelling, which was painted white. 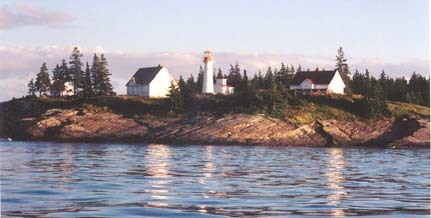 The later lighthouse was a wooden "pepperpot" type, painted white with a red lantern. In 1989 the light was automated. It was still in good condition - it just needed a coat of paint, but it was replaced by a fiberglass tower. 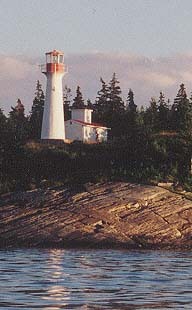 In1990 the "pepperpot" light was pulled over and burned by the Coast Guard. The keeper's houses remain at this automated and de-staffed station. 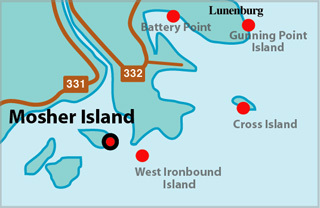 The Mosher Island Preservation Society was formed in 1996 with the goal of preserving, protecting and promoting the Mosher Island Lighthouse property. The society has filed a proposal for preservation and sensitive development with the Department of Fisheries and Oceans.